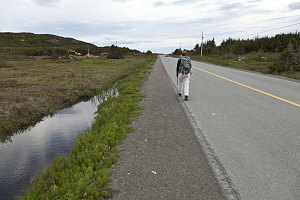 Our goal was to head eastwards on the Island of Newfoundland; it was now the 26th of June, and we had two more days to explore around before having to present ourselves at the Argentia ferry terminal on Tuesday afternoon. 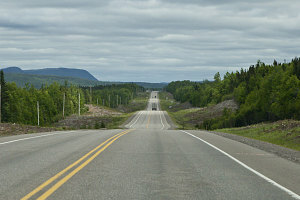 Highway 430 south out of Gros Morne terminates in the town of Deer Lake, through which the Newfoundland portion of the Trans-Canada Highway traverses. We stopped briefly in Deer Lake for lunch and a gas fillup, then headed off east. 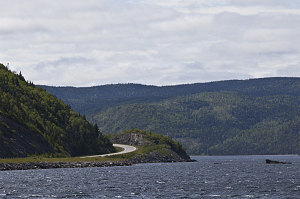 Newfoundland's Highway 1 led through vast, rolling wilderness, dotted with many lakes and a few sizeable hills and low mountains. It is a nice enough highway, signed at 100km/hr, but it is only a two-lane road. It forms the only road link between the western and eastern part of the province, and as a result is fairly busy. I suppose one day it might be appropriate to consider twinning the entire length of it. Our next destination was a spot roughly halfway across the island, east-to-west, and along its northern coast: the small fishing (and tourist) community of Twillingate. 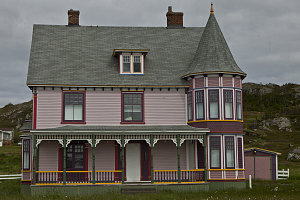 While its glory days as a major fishing community may have faded, Twillingate has over the years ramped up its tourist industry, and today it is well known for rugged coastal views, icebergs, and whale watching. The town promotes itself as the iceberg capital of the world. I suppose it must be said that such marketing did have an effect on us. The idea of some pretty coastal hiking and the chance to see some icebergs (which so far we had seen none of) sounded pretty good. So, that's where we headed. 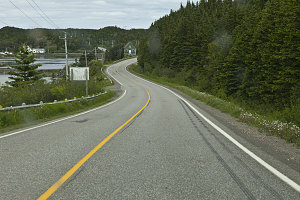 We turned off left at Notre Dame junction along the Trans-Canada, onto regional highway 340, one of two main roads leading north to the cluster of islands and peninsulas upon which Twillingate is located. 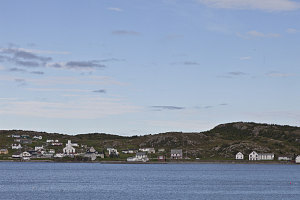 The drive led through many little communities and alongside many bays and harbours. 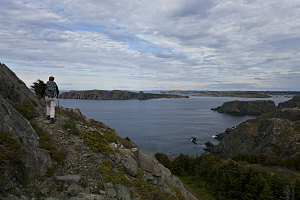 We crossed three causeways, hopscotching across a couple of islands before finally winding up on the double-island of South and North Twillingate. 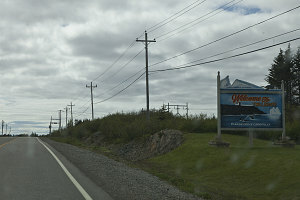 The actual town of Twillingate exists right at the closest point between the two islands. 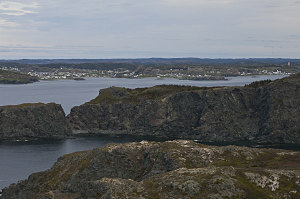 Part of the town of Twillingate is on South Twillingate island, and part on the north. A short causeway links the two parts together. 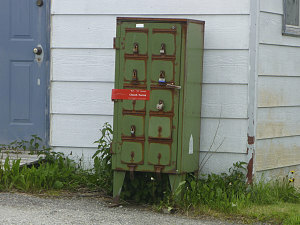 I had pre-booked a room in a local inn on the internet, and our first order of business was to locate it and check in. We didn't really know where it was, but the town only has a few thousand residents, so finding it seemed a matter of elimination, and would give us a little impromptu tour of the place. 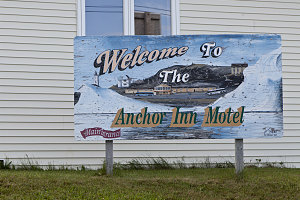 It wasn't long before we located the Anchor Inn Motel - on the far side of the North Twillingate Island side of town. We checked into our room, but, even though we had just finished with 3 days of backpacking, we did not get cleaned up. The reason for the delay was one of logistics: our available time in Newfoundland was growing short, being limited by the fixed time of our ferry ticket off of the island. 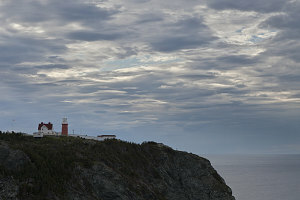 We wanted to do some sort of a coastal day hike in the area, but we also wanted to be driving eastwards towards St. John's by mid-day at the latest the next day. We figured that the most opportune thing to do was immediately head off for an evening hike, freeing up more time for tomorrow. And that is why we did not get cleaned up. 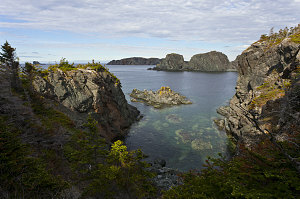 Just a few kilometres north of the motel was the northernmost tip of North Twillingate Island - an area called Crow Head. There is a nice trail network on Crow Head, and my pre-trip trail investigation had flagged it as a good choice. This was where we were now headed for our rapid evening hike. It was 5pm, which meant we had three or four hours' worth of time in which to complete our intended hike - a coastal circuit of Crow Head. And if we were fast enough, we could still make the Inn's restaurant before it closed at 9pm. Starting at a nondescript (but signed) roadside trailhead, we headed up through a small patch of forest, winding through what was clearly a very newly-blazed section of trail. Soon we had glimpses of a rocky shoreline ahead, and soon after that we had the first of many spendid views of a rugged shoreline, dotted with small points and coves, and with jagged rocks pretty much everywhere. The trail was always going steeply up or down, but never for any great amount of elevation. It wound along the edge of the coast, and the closer we got to the nothern edge of the Crow Head peninsula, the more barren and less vegetated the terrain became. Visibility was good and there were great views out into the vast North Atlantic, but, alas, none of those views included any hint of icebergs. Aware of our time constraints, we were pushing quite hard, stopping only for short periods of time and walking quite briskly when we were on the move. Soon, we were at the halfway point of the circuit, at the big Long Point lighthouse. Continuing on, we started down the other (western) side of Crow Head. 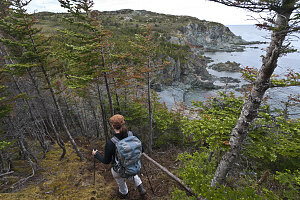 The western side's trails are slightly less rugged, but the coastal terrain and the views no less than on the other side. 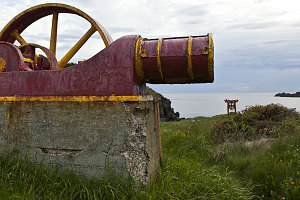 We arrived at Sleepy Cove, notable for a 1900s-era copper mine, and stopped to take in the old, brightly-painted machinery. Despite our fast pace, we were still cutting it close with regards to making it on time for the closing time of the Inn's restaurant, so we decided to cut off the last bit of our circumnavigatory hike by taking a bit of a shortcut along the lighthouse road. Another twenty or so minutes of brisk roadside walking brought us back to the car. By 8pm, we were back at the inn, giving us time to get 3 days and 40 kilometres' worth of hiking grime off. 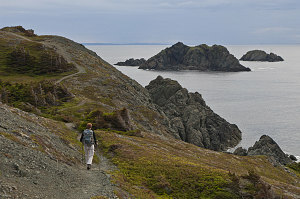 If you are interested in reading more about our hike around Crow Head near Twillingate, along with a lot of extra pictures not in this main narrative, please click here. Dinner at the Anchor Inn Motel's restaurant was quite decent (and the waitress was very witty and pleasant), and we retired, quite satisfied that we'd crammed as much as possible into the day.